Home Community Is a resurgence of Alaska reindeer herding coming? Is a resurgence of Alaska reindeer herding coming? Then I saw the reindeer — no, not reindeer — those are caribou. We have reindeer at home, but they are still inside a fence. There is little difference between reindeer and caribou at first glance. Reindeer tend to be slightly smaller and stockier, but caribou and reindeer are basically the same animal. One is domesticated, the other is wild. The tame ones in our corral eat pellets, barley and haylage. Wild ones roam outside the fence. They dig for lichen and browse on dwarf birch. Caribou and reindeer will intermix and interbreed given the opportunity. The few fenced herds along Alaska’s highway system will not get that chance. 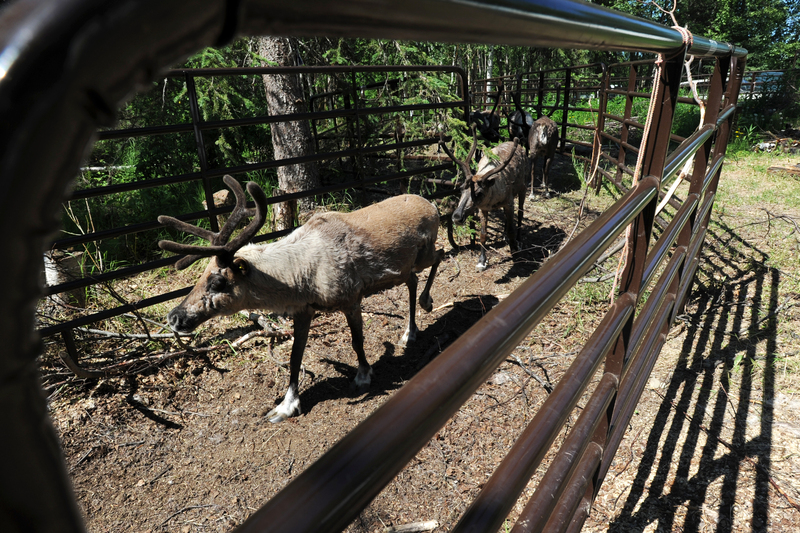 Reindeer, domesticated as they may be, are one of the more tightly controlled types of livestock in Alaska. The fear that domesticated deer may infect the wild populations is given as the reason for the controls, but in reality, economics likely play a larger role. 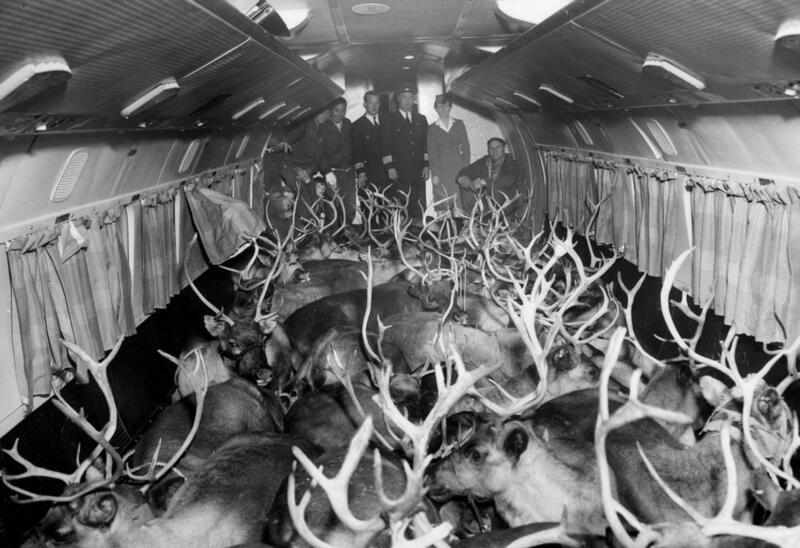 The 1937 Reindeer Act instructed the federal government to purchase all non-Native owned reindeer in the Territory of Alaska, appropriating $2 million. At the time, there may have been as many as 500,000 reindeer in Alaska. At the risk of over-simplification, the federal government wished to restrict ownership of the deer in the territory to Natives as a creative leg-up in establishing an industry. After all, reindeer meat was a popular alternative to beef in the Lower 48 during the late 1930s and early ’40s. Reindeer were first introduced to Alaska from Russian herds in the late 1890s. Only a few were brought in initially, but over time, non-Native capitalists, native Laps and Alaska Natives all became herd owners in Western Alaska. The high point was in 1930, when an estimated 640,000 deer roamed the state’s western coast. Disease, predators and intermingling by local caribou herds gradually decreased the population of domestic reindeer. The popular Nelchina caribou herd is a case in point. The approximately 1,400 reindeer that arrived in Cantwell from Goodnews Bay in 1922 had completely been absorbed into the wild Nelchina herd by 1928. Today, the free-ranging deer of the Seward Peninsula carry 10-15 percent caribou DNA. Lack of interest in herding and no ready market for reindeer products has decreased local participation in the deer herds of that area. The Seward Peninsula, Nunivak and St. Paul Islands and a few locations along the Aleutians hold the vast majority of the 30,000 or so reindeer remaining in Alaska. There are a few fenced herds along the road system that may account for a few hundred domestic Canadian reindeer. The 1937 reindeer act prohibits non-Natives from owning Alaska reindeer or their offspring, but thanks to a 1987 court challenge by Palmer herder Tom Williams, anyone may own out-of-state deer. Williams continued his fight for the right to own reindeer 10 years before finally winning at the Ninth Circuit Court of Appeals in 1997. Virtually all of the deer in Alaska owned by those other than Native herders are Canadian deer. The reindeer that my family owns have descended from this Canadian bloodline. They are short and relatively heavy-set. Reindeer tame quite easily. Think of a horse that is not quite so needy. Think of a dog who lives in the yard and socializes with other dogs more than people. Cross these personalities and one has a deer. Left to their own devices, they are quite content. In our yard, they see someone at least three times a day, yet go about their own business during the visits. They will come to warm water — it is like morning coffee to them — and salt is a favorite and is one of the few things they will take from hand. Other folks have tamer reindeer than ours. The experimental farm at the University of Alaska Fairbanks has deer that are wilder than the ones in our pen. I have little hands-on knowledge of reindeer, though I have lived in the midst of caribou my entire adult life and watched them for hours on end. One of the big surprises was how well the deer get along with dogs. Almost every morning the German shepherds and the reindeer sniff noses and greet each other. Sometimes a game of “chase the dog” ensues. At other times, they lay quietly next to each other while I feed and water. Reindeer are a learn-as-you-go project for the uninitiated. They are interesting animals with great potential for Alaska industry. At present, though, they are under-utilized and over-priced. However, I believe that given a resurgence of interest that appears to be taking place, there is an opportunity for change.